Please visit our CONTACT PAGE to send us an inquiry. To submit PHOTOS please use the CUSTOM REQUEST forms. Heartwood Carving was founded in 2003 in Eugene, Oregon in the beautiful Willamette Valley. Our initial purpose was to produce unique designs and carved trim for the RV industries headquartered in the area. Through that process Heartwood developed an expertise for the efficient design and production of a multitude of uniquely carved parts to exacting standards for quality, cost and delivery. That experience enabled Heartwood to expand that offering to the residential and commercial markets and bringing our interpretations of architectural and artistic wood carvings to a wider audience. Our team has created a variety of standard products but also work with clients to create original carvings specifically suited to individual needs. We can also customize existing designs from our ever expanding catalog to fit any project. We offer "Restoration"services for the reproduction and reinterpretation of period wood carvings. 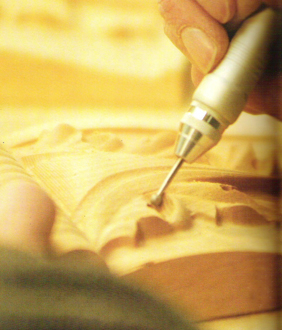 By employing several software platforms and an innovative use of CNC (computer numerical control) machinery, Heartwood Carving is able to produce nearly any project from simple to complex in nearly all styles, sizes and applications. Our goal is to always provide the same excellence in quality and service so that Heartwood Carving's ornamental, architectural, artistic, commercial and custom pieces will add delight, charm and value to your home or business for many years. Please visit our CONTACT PAGE to send us an inquiry. Visit Heartwood Carving, Inc.'s profile on Pinterest.